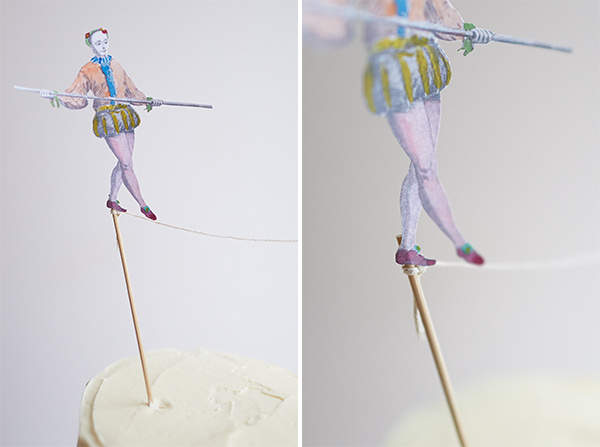 We’ve all seen our fair share of two-sticks-and-a-piece-of-string-cake toppers, so this topper is simply a visual pun on the idea. 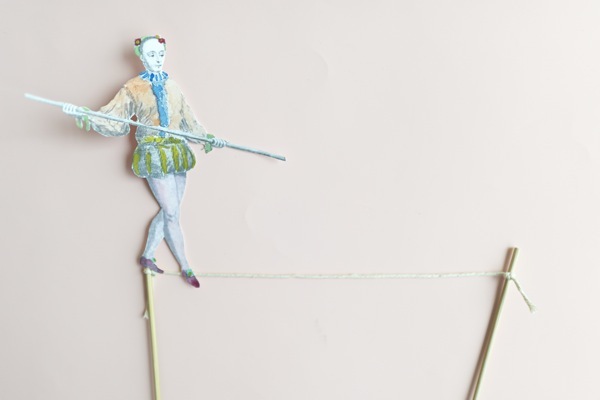 This string, in this instance, is the tightrope – and a pretty little water-colored lady is about to take her first cautious step out onto it. It’s simple to make and it will make everyone smile. 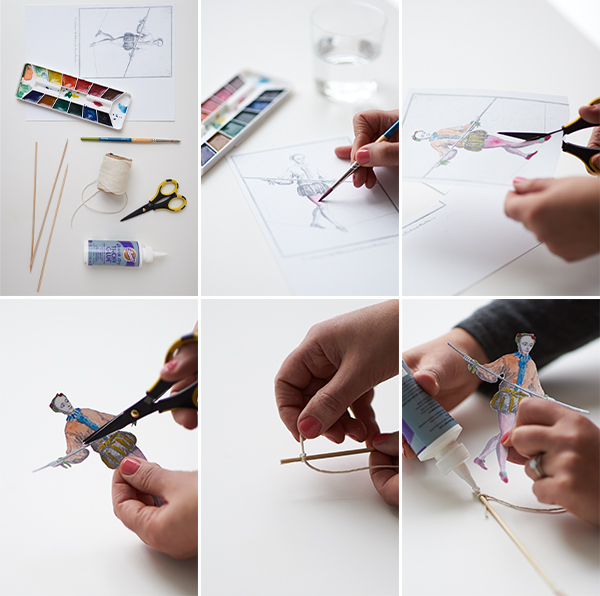 Step 1: Follow this link to Vintage Printable’s Female Aerialist. On the lower right side of the screen, click “View Full Size.” In your printer setting box, change the scale of your printout to 75%, and print it out onto white card stock. Step 2: Watercolor the “Aerialist” in the colors of your choice. Let dry. Step 3: Carefully cut out the figure. Tip: Cut just on the INSIDE of the edges, so there is no white edge showing when you are done. Step 4: Cut out the negative space where her body, right arm and her stick meet. Step 6: Glue her left foot to the top of the left skewer. Let dry. Step 7: Let the party begin! Oh this is the best! 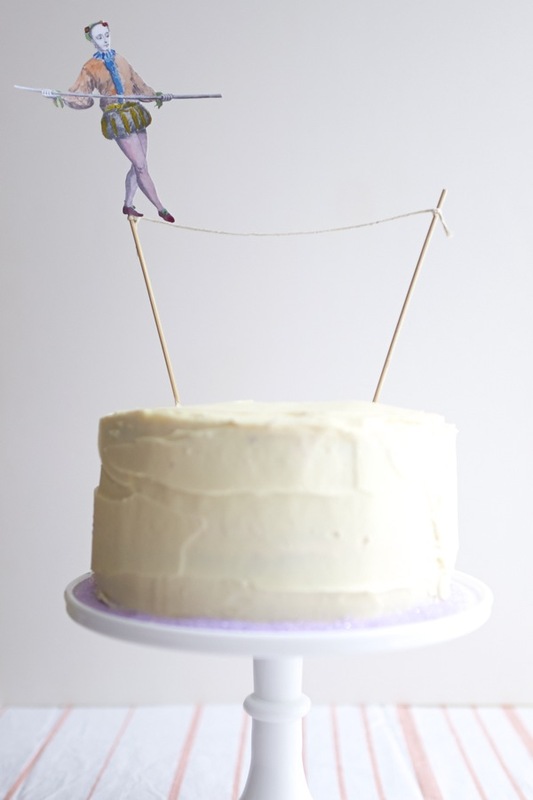 This might be my favorite cake topper I’ve ever seen. Love the tightrope! Hi! I’m so loving this and been a follower for some time! I’m doing either a 5 de mayo birthday party or a fiesta party but I don’t want it to look tacky. More creative than anything else. Do you have any posts related to that theme? Hey Natalie! We haven’t done a ton, but here’s one of my favorites: http://ohhappyday.com/2012/04/diy-geometric-fiesta-garland/ Good luck! Ha! If you do, send photos! this is the best. simply the best. you win the internet. This was all Chiara’s idea. She’s amazing! How cute! I am in awe! one of the cutest things EVER. reminds me of victorian paper dolls i used to have as a kid. thanks for the diy tutorial, this would make a great saturday afternoon craft! What a gorgeous idea! So unique! Hahaha this is such an adorable idea! That is fantastic! It’s such a simple, but whimisical idea! I really like the simplicty of this, stunning yet elegant Not quite sure I’m as artistic with thewatercolours as you are though! love this idea!!! you have just made my day! i need to bake an ‘action and adventure’ cake for my son’s boy scout troop and was floundering around for ideas. thank you so much!!! OMG!!! We love this. Seriously, so cute.